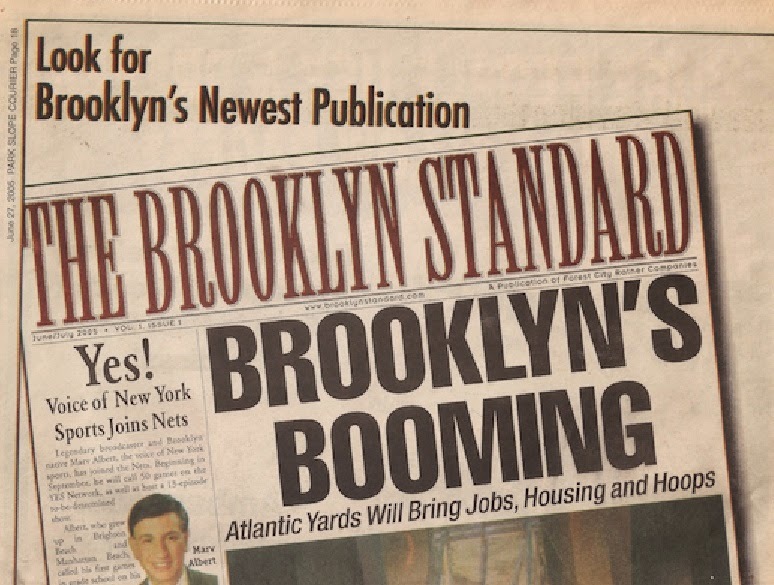 Just in time for the Environmental Impact Scoping hearing 10/18/05, the second (Fall 2005) issue of the Brooklyn Standard, the Forest City Ratner "publication" that first appeared last June dated June/July, and it manages to maintain the same promotional, propagandistic style. Unfortunately, it's not available on the web yet, but here's a look at the top of the front page. One change: there are no longer fake "letters to the editor" from the likes of Mayor Bloomberg. There are no letters to the editor at all, which is curious, since it's likely that some people wrote to the paper. Then again, the Editors in Chief are Forest City Ratner officials Barry Baum and Scott Cantone, so they could be using their editorial discretion to further the company's mission, which is to build "superior, long-term value for its stakeholders." Let's start with the photo on the front page, which is captioned "A panoramic view of Vanderbilt Yard today." See the four-story brick building in the center? Well, one of the residents won't sell to Ratner, and has posted a banner outside his window that reads "I love my neighborhood and my home. And I intend to stay." Either this picture was taken years ago, before Ratner announced the Atlantic Yards plan, or that banner was excised from the picture. I dissect the errors in and curious circumstances behind the lead story, headlined "MTA Approves Atlantic Yards Bid," in another post. Also on page one, a story headlined "Historic Community Agreement" features rhapsodic praise for the Community Benefits Agreement. As I've written before, experts on CBAs say this one isn't legitimate. On page two, the story headlined "Small Businesses Flourish At Metrotech" is also criticized in another post. Let's go to the "Frequently Asked Questions About Atlantic Yards" on pages 4 & 5. The third question asks if Eminent Domain will be used. The answer evades that question. Of course eminent domain will be used. Some people won't sell. Also see page 4 of the MOU. The fourth question asks if the project will "bring in more traffic than the area can handle?" The answer: No. But the whole point of the ongoing Environmental Impact Statement scoping process is to examine that. This City Council briefing paper, dated 5/26/05, points out some of the concerns about traffic. The fifth question in the Q&A cites $200 million in (direct) city/state contributions but fails to note that even FCR acknowledges that the project would consume over $1 billion in public costs in 30 years. See Chapter 3 of my report. The last question in the Q&A says the project will generate "15,000 union construction jobs and thousands of new office jobs." First, construction jobs are calculated in job-years, so that would be 1,500 construction jobs over 10 years, as I point out in Chapter 2 of my report. The "thousands of new office jobs" as pretty vague, an indication that the company hasn't kept its promises. In December 2003, Ratner predicted 10,000 office jobs for approximately 2 million square feet of office space. The NYC Economic Development Corporation, using more conservative figures for amount of space needed per person and building in a 7% vacancy rate, predicted 7,100 jobs. The amount of office space has since been cut to 628,000 square feet (3,140 jobs, at Ratner's formulat of 200 square feet per worker), as Ratner has traded office space (jobs) for luxury housing. That means the number of jobs has been cut significantly. See Chapter 2 of my report and this post, which points out that, according to NYC Economic Development Corporation calculations, there would be 2,229 office jobs, including 669 new ones. The page six column by Bertha Lewis, executive director of the New York chapter of the Association of Community Organizations for Reform Now (ACORN) deserves notice for its stubborn commitment to unreality. "ACORN is all about working families," she declares, going on to cite the "50-50 balance for affordable housing, one of our proudest and greatest accomplishments as an organization." Then she writes, "In the years to come, 2,250 more families will have housing in a neighborhood that was moving in the wrong direction... If this project can stem the overwhelming tide of gentrification in central and downtown Brooklyn one iota, then it will have been worth it for the housing alone." As noted, only 900 units are aimed at those below Brooklyn's median income. The other 1,350 affordable units will go to people with a median income of $75,000, surely not ACORN's constituency. And, as Lewis somehow neglects to notice, there's no longer a 50-50 program for the project as a whole. The 50-50 housing deal covers only the 4,500 rental units. Since then, Ratner has announced plans for 2,800 market-rate condos, surely part of the "overwhelming tide of gentrification."